Is health-damaging mold lurking in your HOME? It’s true: Mold can make you and your loved ones seriously ill. But now you can get a professional inspection to learn if your home is a breeding ground for dangerous mold. First, HouseCheck’s experts visually inspect your residence for signs of mold. Next, we’ll take readings with an infrared camera. 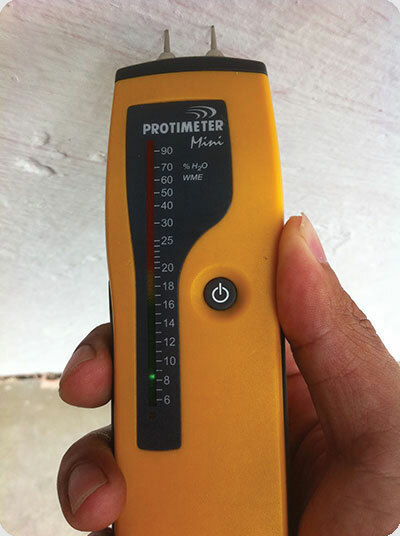 We’ll check for moisture inside your walls. We’ll also inspect your air conditioning unit to see if condensation might be creating microbial growth. If our inspection reveals that your house is at risk, we’ll explain our findings and detail your options for further testing to pinpoint the location and severity of the issue. If additional testing reveals mold is present, we’ll recommend effective steps for removing the mold. Once remediation is complete, we’ll retest your house to make sure your home is clear. – Mold is a fungus that lives both indoors and outside. – Mold thrives in moist, damp places. – Mold reproduces by creating microscopic spores. – The spores can travel through the air. – When mold finds the right environment it will grow and grow and grow. your loved ones’ health and safety? Is your home a breeding ground for dangerous mold? To know for sure, have a complete, professional examination from the mold inspection specialists at HouseCheck Environmental Services. Our mold inspection procedure -- and our team of professionals -- are second to none. Don’t wait to safeguard your family from the well-known health risks associated with household mold. To explore the options – and sign up for your inspection – call HouseCheck’s inspection hotline at (239) 312-5574 or click the request mold assessment button below and fill out the form.